Welcome to another addition of Fully Functional, focusing on getting the most out of you MTGO avatars! 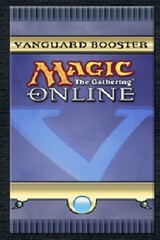 When you first open a MTGO account, you will find a special Vanguard Booster in your collection. For those that were around during the release of Vanguard it was really interesting to find your basic avatars missing and replaced with a booster, only to be opened to get your basic avatars back. Weeeee. These basic avatars are representive of each of the colors of Magic. Serra Angel, Prodigal Sorcerer, Grinning Demon, Goblin Warchief, and Erhnam Djinn. Later, R&D would try to match the abilities of the avatar with the abilities of the original card, or feel of the set, however, when Vanguard was first released, we got "on color abilities" for each avatar. I try to stick as much as possible to WUBRG order; White Blue Black Red Green color order for Magic. I was planning to address the avatars in this order, but what I have working against me is that the cards are displayed in alphabetical order and from what I've seen, the MTGO client doesn't really stick to this "standard" as the collection view by color sorts as BUGRW. The other thing is that these avatars really don't have color affiliations to them beyond the origin of the namesake creature and their abilities. Mark Rosewater talks in depth about WUBRG here, and why RAV block casts costs where done the way there were. 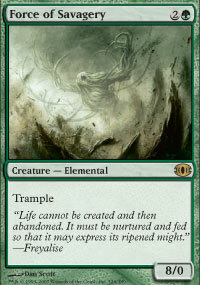 Erhnam Djinn - Whenever you play a creature spell, put a 1/1 green Saproling token into play. Goblin Warchief - Attacking creatures you control get +1/+0. Grinning Demon - Whenever a nontoken creature you control is put into a graveyard from play, target opponent discards a card. Prodigal Socerer - At the beginning of your upkeep, look at the top card of your library. You may put that card into your graveyard. Serra Angel - Whenever you play a spell, you gain 2 life. These are the avatars that everyone online has access to. I'm rather surprised that he would be an "iconic figure" in the world of Magic, being from the Judgement set. If I do my math correctly, Judgement would have just been released in May or so in 2002, just before MTGO came online (out of beta) in June that year. In any case, I'm really glad that I get to start with "Ernie" because he's featured in my latest pet deck. If Judgement came out in 2002 just before MTGO, then how would you explain this guy, who didn't appear in a Magic set until a year later? After some intensive history gathering, I'm thinking that because the avatars did not have a name before and the settings just said "Select your avatar". Therefore this was just "some goblin" prior to the ability to gather and trade avatars. I assume this change was made in MTGO 2.0, because of this announcement that talks about the 2HG avatar being added to your account settings. I also noticed in the historical screenshots hosted by cNET that there were a lot of generic avatars such as elephant, tiger, or skeleton, that eventually became Loxodon Hierarch, Stalking Tiger, and Brashark. Hmm. You want creatures that attack. Pretty straight forward. At first I thought this was templated "Whenever a creature you control attacks it gets +1/+0 until EOT", however it is only while it is in the state of attacking does it get the bonus. The way I was thinking, I really wanted to make my critters grow and grow with Breath of Fury with our best friend, Nether Traitor. 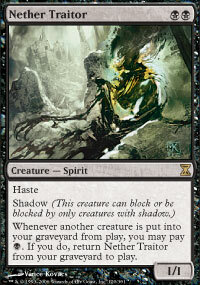 In any case, haste, shadow, and the ability to return to play all for two mana is still pretty good for this avatar. Speaking of Nether Traitor, anytime you're cycling creatures through your graveyard and into play, you're going to want Nether Traitor. This means you sacrifice the traitor to an ability of some sort and then B: Rinse, Repeat. You can use this same trick with Fallen Angel, Flametongue Kavu (hmm this sounds exciting), or Teysa. Going the Extended route, we saw in the Kamigawa block a "soft lock" with Shirei, Shizo's Caretaker and Bile Urchin. 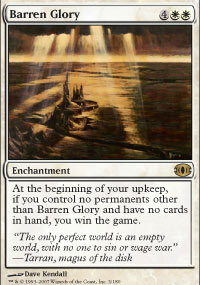 This apparently combos brilliantly with any preexisting deck you own, as we can see from the vanguard tournaments. It's not a bad idea really, and if you would like to start playing vanguard, the step into the kiddie pool would be to take an existing deck you love to play with, and add this guy for the bonus card in hand and draw-fixing. When vanguard first came out, this was my favorite avatar. I started with an affinity/brainfreeze/Erayo type of deck for Extended, which is still in Extended, and probably still really hated (combo, decking, and affinity). I took that same basic idea into the first vanguard tournament, with a WUg (White/Blue splash green) control deck, that decked an opponent, or if I got really ahead on time, I'd take my win conditions out and control the board until my opponent timed out trying to pay for Ghostly Prison. Yeah, that was pretty uncool. These days, there's a nifty "one card combo" with Searing Meditation. Cast a spell, pay 2, deal 2. Speaking of "One Card Combos", a card that naturally abuses your selected avatar, here are a few favorites, from Standard (if only because they're newer). FTK turns wary Norin into NORIN, THE BERSERKER! 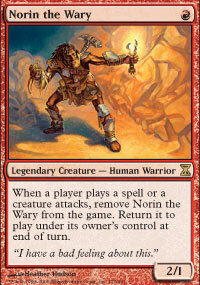 For every little spell or combat phase, Norin will pop out of play, and back in with a vengence. Just like the FTK, Norin will go ahead and burn himself out so we'll have him play with some friends: Order of the Stars and Stuffy Doll. Most likely, with a turn one mana man (Bird or Elf), you're getting an 8/1 on turn 2. With enough mana, you can get yourself a Phantom Wurm that's unkillable by damage. Feel free to load these guys up with your favorite pieces of equipment (which nicely gives your top heavy trampler first strike). I like the surprise Grifter's Blade and the bomb Loxodon Warhammer. I have to admit, this wasn't my idea, but I faced this brilliant deck in the casual room. Barren Glory hit the table, my opponent activated his Phyrexian Totem, sacrificed everything for the horror including itself, before I Krosan Grip'd his Glory. It was the only card he was really afraid of and was therefore running Black and White for Castigate. The second place winner of the one card combo is also white and can be included in this deck as well, and that's Magus of the Disk. Destroy everything while regenerating your destroyer. Here I was going to add Sakashima and talk about Nether Traitor again, but figured "let's just get it over with". and it certainly doesn't go to Rhad, because after several hours of writing and researching he closed his browser only to come back to a half finished article later on. Sakashima - I made a deck with Nether Traitor, a bunch of Chronozoa and Kher Keep. Kher Keep would be my one card combo here, but if you're opponent doesn't play anything worthwhile, then that's where the other two guys come into play (ha ha). Making anything a copy of Chronozoa means there's no time counters, and therefore if it goes to the grave, you get two more Chronozoa to play with. Attacking with your usually unblocked shadow creature is nice when you can turn it into something else after the blockers have been declared. There is however, a bug that prevents the Nether Traitor's triggered ability from tiggering if it went to the graveyard as something else, and really, why would you not make it something else? Wizards: please fix (maybe after V3, and my flagbearers). Thank you. Hell's Caretaker - Instant Zombifys, 3B: Put a creature from your graveyard into play (3 for the ability and B to get a traitor back). Momir - While you're discarding your madness and flashback cards for low cost weenies, I'm going to assume that you would be using Dread Return to use such 0/3 or 0/2 weenies to bring back a fattie you might have discarded or better yet dredged into your graveyard. This only makes our little traitor that much sweeter as a "play from the grave" and more fodder for more Dread Returns. Seshiro - I'm thinking that Hollow0n3 was referring to Nether Traitor in the last comments section and all the sick things you could do by making him a Saproling. Adding various Thallids you could get: Deathspore Thallid = B: Target creature gets -1/-1 (not unlike Nether Traitor and Plagued Rusalka), Thallid Germinator = B: Target creature gets +1/+1, and (Psychothrope Thallid) = 1B: Draw a card. Grinning Demon - Add Nantuko Husk, Plagued Rusalka, or Thoughtpicker Witch and you're respectively pumping your critters, killing other critters, or fatesealing your opponent's deck (Look Ma! I used a new keyword in a sentence), while trashing your opponent's hand. Fallen Angel - Same as above, but instead of hand disruption, you're disrupting the life totals, more effective. Teysa - Same as above (above), but with the least amount of hand and life handicaps, and with twice as much pumping, killing, and fatesealing power by making flying tokens each time you cycle your traitors. Flametongue Kavu - I thought that this would be pretty fun, but given more thought, here's how it will probably work in the real world: pay one black mana until your critter deals 0 to itself and lives, or until you run out of mana trying. Loxodon Hierarch - For the cost of one black mana, you can regenerate one of your creatures...that's rather appropriate. Let's all give a nice round of applause for our Most Valuable Player, who pretty much stuck with the accessible (budget-friendly) avatars. Finally, I'd like to share a deck and ask for your assistance. It's a pretty good concept if I do say so myself, but has been less than stellar in actual games. In a perfect world, I'd have the Brooding Saurian to get all my stuff back, but while I'm "borrowing" someone else's permanent, I can sacrifice it to a guildmage or Perilous Research. Periodically I'd have my Imaginary Pet "stolen" only to have him came back home on my opponent's turn. Bronze Bombshell is also there as a tojan horse. Lastly, Clutch of the Undercity is nice enough to give the owner back his card while punishing the controller. In the imperfect world, I get people's tapped lands and find myself short of mana. Is there hope for this avatar yet? Let me know, and as usual thanks for reading, or better yet, playing. Ernham has been around since Arabian Nights..he was a reprint in Judgement (along with Sengir..) he's an Iconic green fattie for a long long time, not just since judgement, thats why he was there..
No, I wasnt referring to Neither Traitor at all.. He isn't a FUS common ;-) .. Sporoloth Ancient likes it when everything you control is a Fungus, especially when Sporesower Thallid and Thelon of Havenwood are arround.